That's the story in a nutshell, however, it doesn't tell you just how action packed, funny, and surprising the story really is. Gordon Rennie has written a wonderfully captivating romp that is a real page turner. Coupled with PJ Holden's engaging artwork, all four issues of Dept. of Monsterology are a joy to read. This is Issue 1 of 4. Dept Of Monsterology "Monsterology 101" collects the first miniseries, plus a new one-off called “The Trouble With Harry” where we explore some of the origins of Brain in a jar in a giant Diving Suit Robot Harry Wilmington. PJ Holden is a Northern Ireland based comic artist.Over the past decade his work has appeared in 2000AD – drawing Judge Dredd, Rogue Trooper, Samizdat Squadron and many other strips. Away from 2000AD, he’s drawn the creator owned series “Fearless” written by Mark Sable and Dave Roth for Image Comics, Robocop vs Terminator for Dynamite written by Rob Williams, Battlefields: Happy Valley written by Garth Ennis as well as the creator owned series Numbercruncher written by Simon Spurrier for Titan Comics. He is currently working on Dept. 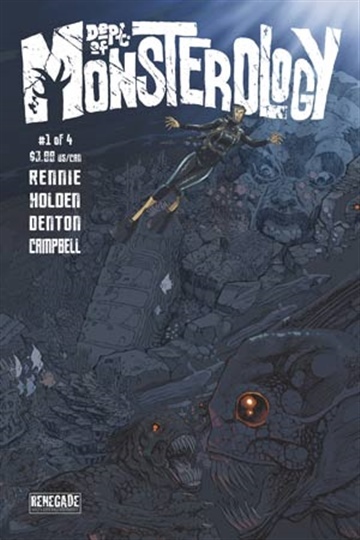 of Monsterology with Gordon Rennie for Renegade Arts and continues to work for 2000AD on Judge Dredd.